My Blogger Buzz: How to Submit Blogger Blogspot Sitemap to Google Webmaster Tools? How to Submit Blogger Blogspot Sitemap to Google Webmaster Tools? To be successful in blogging, a blogger have to generate decent organic traffic to his blog. Organic traffic is the traffic that comes from major search engines like Google, Yahoo and Bing. To attract organic traffic to our blog we have to do many SEO steps. One of them is to submit our Blogger Blog Sitemap to Google Webmaster Tools that helps Google to index our all posts easily. Sitemap is the collection of all of our blog posts and when we submit it to google all of our posts will get indexed and it also tells Google about our new post. So today i will share some easy steps to submit your blogger sitemap to Google Webmaster tools. Below are the easy steps you have to perform to submit your blogspot blog sitemap. Click on sitemap button as shown below. Once you click on the button, a small box will appear as shown in the screenshot below. Congratulation! You have finish the process of submitting your blog sitemap. Notice: The above sitemap will work for starting 500 posts only. If you have more than 500 posts published on your blog, then you have to add one more sitemap. Whole procedure will be same but at this time you have to add this code. All Done and You are ready to go! 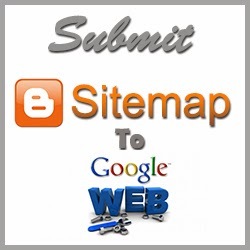 I hope this post will help you to submit your sitemap to Google Webmaster tool. If you have any query regarding this post then please let me know in comments till then Peace, Blessings and Happy Submitting.